Do pastors lie? Now there's a controversial question. Certainly they are no different than the rest of us in that they are just as susceptible to lying as you and I are. If that question bothers us, could it be that it does so because we have somehow elevated to role of pastor to some strange place that God never intended us to? Hmm, I wonder. 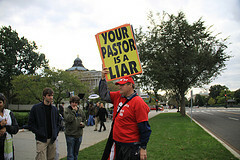 Perhaps the question needs to be revised; do pastors deliberately lie? Well, now there's a hot potato. Let me just say this, and then I will leave the subject alone! No, I'm sure they don't deliberately lie, but that's not to say that the truth they think they're proclaiming isn't sometimes a little misguided. Someone shared this video on Facebook. I thought it a good message worth sharing. What is your take on this? How comfortable are you in publicly rebuking or correcting a pastor if you believed him to be in error? Do you think the author is correct? Why or why not? I've had pastors tell me things that turned out to be untrue...but I don't KNOW of any that have lied to me. Although, it certainly is possible. A lie is when you tell me some thing is true that is not true...and you KNOW it is not true. If you believe it is true but it is not...you are simply misinformed and passing on your ignorance presented as truth. I believe that happens a lot. Unfortunately, I suspect that it may be more common than we'd like to admit. I remember one well known pastor who, during a fund raising campaign said, "It's a miracle!" as he spoke of how God put some gold into his mouth. Later the truth came out as his dentist said that it wasn't really a miracle, but rather that he put the gold crown in there. LOL. However, though we laughed about it, it was really quite sad. My Friend Gerald on Facebook said, "Well, you can rest assured that I will not be 'putting my mouth on a man of God' or any other man for that matter! What a poor choice of terminology. LOL!" I believe we have the right to challenge each other in the faith. I also believe in giving respect and honor to those in authority. The Bible talks about how to approach an elder. It is not single them out and just call them out in public like a heathen. No I do not feel that a pastor has ever lied to me or said anything to me for the purpose of controlling me. I have sat under very good leadership. I also know that God is my ultimate head and leader. Pastors are people. Therefore, they do lie. Sometimes unintentional, and sometimes regretfully not. Most pastors have given their lives to studying the word--sometimes on a deep academic level. This is to be respected. Moreover, the call of God on their life is not to be shunned. How sad it is that sometimes pastors take their biblical authority for granted! If lay people need to critique or rebuke a pastor, they need to have the courage to (1) do it one-on-one with the pastor, as opposed to forming a club against him/her, and (2) be very, very sure that the issue at hand is worth debating. I don't think that the majority of ministers lie intentionally, but unfortunately there are few who do. Once we are aware that a minister is practicing deceit, we should decide if this is the minister and ministry that we should continue with and not to be too afraid to separate ourselves if it is meant to do so. In other words, it is important to determine if we are able to have confidence in spiritual leadership that is deceptive. Realize that in the secular world, deceptive leaders are required to resign their posts. For example: Richard Nixon and General David Patraeus. It should be expected that in the spiritual aspect more is required of us.